Using FileVault full disk encryption is one of the better ways to protect your Mac and personal documents from prying eyes and password resets, but if you’re troubleshooting a Mac with FileVault, either your own or someone else’s, it’s kind of annoying to have another layer of passwords necessary to enter before you’ll be able to get in. 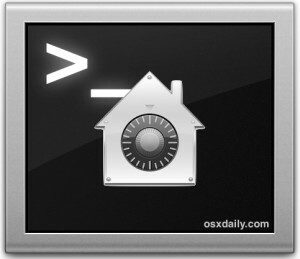 Additionally, for situations where you’re performing remote management or administration tasks through SSH or Remote Login, if you were to need to reboot the remote Mac to install an OS X update, you wouldn’t be able to enter the necessary FileVault password, right? Well, yes, unless you temporarily bypass FileVault with an authorized restart. Using Authenticated Restart allows you to bypass entering a FileVault password on a per-boot basis. In other words, it does not disable FileVault for more than the specific reboot, which can be really helpful for remote management purposes. Once you enter the admin password the Mac will reboot directly from the command line, but rather than a standard sudo shutdown -r command and boot, you’re basically pre-authorizing the restart to bypass FileVault on the next system start. If “true” is echoed back, you’re good to go. If it says “false”, you’ll probably want to skip the reboot otherwise the Mac will be unavailable until the FileVault password has been entered manually in person. So the next time you’re doing some remote management, system updates, troubleshooting, or whatever else, keep this in mind. Do keep in mind this only applies to FileVault security, there is no way to remotely bypass a hardware-based firmware password that has been set on a Mac. Heads up to LifeHacker for the excellent tip find. Is it really “bypassing” filevault, or more likely, storing and using the credentials for the next boot, and then (hopefully), clearing the stored credentials. Yes, exactly. As described. Bypass Filevault on the next boot, Filevault stops storing the credentials temporarily after that. It can’t be both. If it is storing the credentials, it is not bypassing FileVault, it is merely bypassing the authorization process. Error: You must provide an action. Use ‘fdesetup help’ for help, or use the man page. how to make this permanent? Disable FileVault if you want to permanently bypass it.